A call to Mark Duncan at Yachting Partners International brings news that Gregory Gheraia has listed the new build 48.7m motor yacht Antinea for sale. Currently under construction at the family-owned Bilgin yard in Istanbul, Turkey, Antinea will be RINA classed with full commercial standards and accommodates 12 guests in four double and two twin cabins. Styled along the lines of a classical gentleman's yacht, she features a steel hull and GRP superstructure and will come complete with zero speed stabilisers. 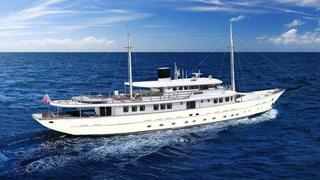 Due for delivery in 2012, Antinea is asking €9.15 million.